Several months ago we looked at balance and alignment issues with the right hand and how that can impact the development of solid technique and good tone. Today we are going to look at left hand balance and alignment issues. When you look at how this young man is holding his flute, what do you see? I see the flute is rolled back toward him, his right wrist is under the flute and his left wrist is in front of the flute, with his fourth and fifth fingers almost completely straight. Also, his head is forward of his shoulders. Can you see that the headjoint is rolled forward more in line with the front of the keys? What kind of problems will this type of positioning cause? In terms of ergonomics, he’s going to be fighting the flute because it will always feel like it wants to roll back. If you are fighting the flute, developing a fluid and relaxed technique becomes much more difficult. The flute isn’t well supported and always feels unstable. Holding the flute this way can also lead to strain in the neck, left elbow, wrist and shoulder. In extreme cases, I have heard of players developing problems with nerve impingement in the left elbow. Notice in the second photo how much better the alignment is for this young man. We turned the headjoint back a bit to between the keys and rods. Now the left wrist is under the flute, supporting it. The right hand is behind the flute and the flute is resting on his right thumb. His finger positions are more relaxed. The weight of the instrument is distributed evenly between both his hands. His ears are now over his shoulders. Now that he isn’t fighting the instrument, his technique improved immediately. The other thing that improved right away was his tone. He could place notes in a big interval much more easily and maintain a focused sound. 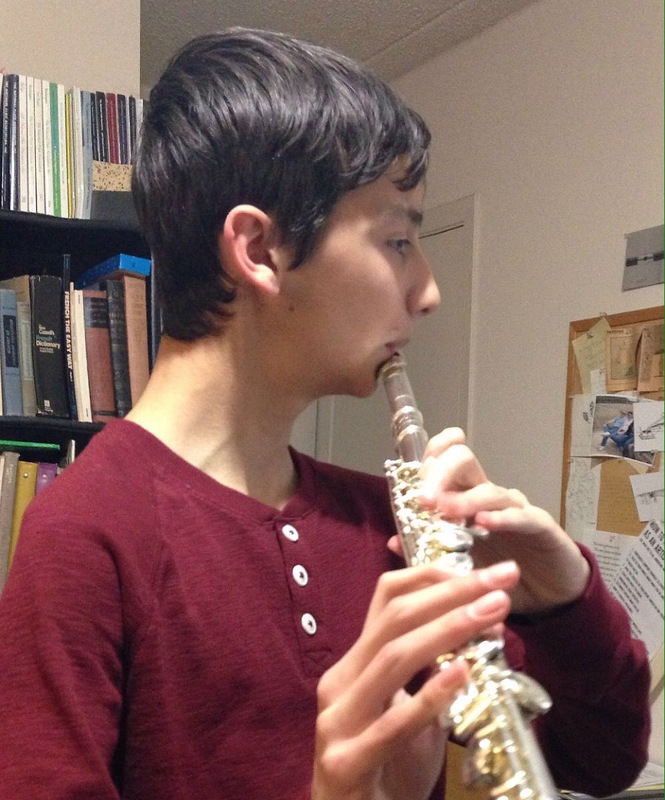 To put it in the simplest terms; if the flute is balanced between the hands, the player can get on with the business of developing good tone and solid technique. It’s really difficult to do this if you are always fighting to balance the flute in your hands. Biggest clue there is a balance problem with the left hand is that the left wrist is in front of the flute rather than under it. Check the headjoint alignment and make sure the blow hole lines up between the rods and keys, as we’ve discussed in the past. Embouchure, embouchure, embouchure – make sure they are shaping the right size aperture, know where the flute is placed on their bottom lip, and that they understand how to change the direction of the air without changing the size of the aperture. Blowing – as important as embouchure. You can have a great embouchure, but it’s not of much value if you’re not putting air into the instrument. Likewise, a student can have great technique, but it is of little use if you can’t hear them due to insufficient air. Be sure to teach kids to drive the air with their abdominal muscles (often referred to as “support”). Balancing the flute and hand positions – turn the headjoint back and turn the mechanism more forward just a little so the weight of the mechanism is more on top, rather than dragging the flute back. Left hand and wrist under the flute to support the weight, right hand behind the flute with fingers extended. Right thumb under and more on the back side of the instrument. Posture – align shoulders over hips, whether sitting or standing. Turn head left about 45 degrees and bring the flute up into playing position. The plane of the body and plane of the flute intersect near the left shoulder. The end of the flute should be in line with your nose rather than in line with your right ear (you will be amazed at the difference in the sound with just this one simple adjustment). Technique – teach the kids the patterns of music including scales and arpeggios in all major keys. Teach your flute students to play in sharp keys. I get it! Band repertoire puts the flute parts into flat keys in order to accommodate the transposing instruments. However, you severely limit the playing options available to your flute students if they never play in any other keys besides F, Bb and Eb until they get to high school. And teach them the correct fingerings in the third octave. Counting and rhythm – be sure to teach kids to count for themselves rather than learning rhythm by rote. In more than 30 years of teaching lessons in schools, I have seen band teachers whose students have excellent counting skills and those whose students couldn’t count their way out of a paper bag until someone “shows them how it goes”. The student who understands rhythm and can figure out music they are learning on their own is much more likely to stick with playing long term. They will be able to benefit from your instruction about ensemble skills more readily because they will be more flexible and adaptable. 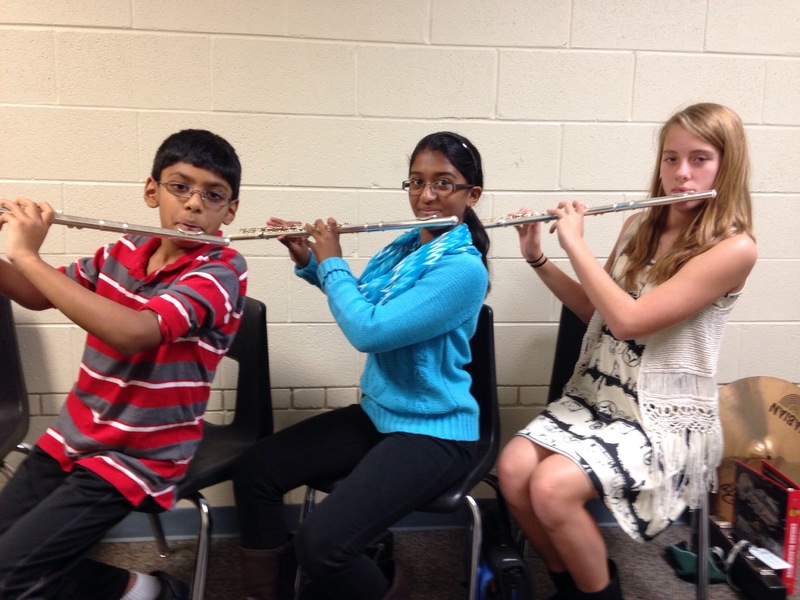 Have you ever seen flute players holding their flutes like this? Were you aware that both of these right hand positions have many negative consequences for students and how they can contribute to the flute section of your ensemble? These consequences can include poor tone, poor intonation, and slow and/or uneven technique. In some cases, hand positions like this can lead to physical problems like tendinitis, carpal tunnel syndrome and other repetitive strain injuries. 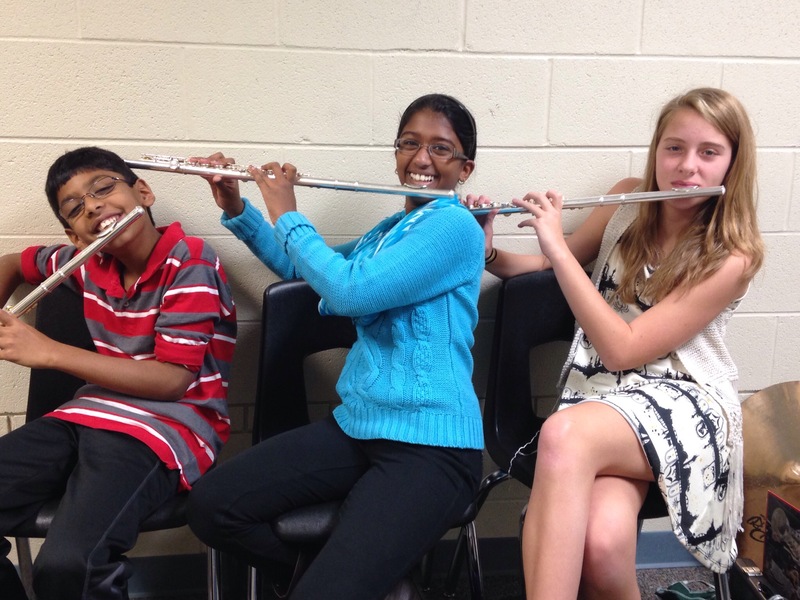 If you recall, in an earlier post from last school year, we examined the issue of balancing the flute in our hands rather than holding it. Take a look at the banner photo on this blog and you will see how I accomplish this. If you were looking from the bottom end of the flute, the rods should be at about 11:00, with the mechanism pointing slightly forward. 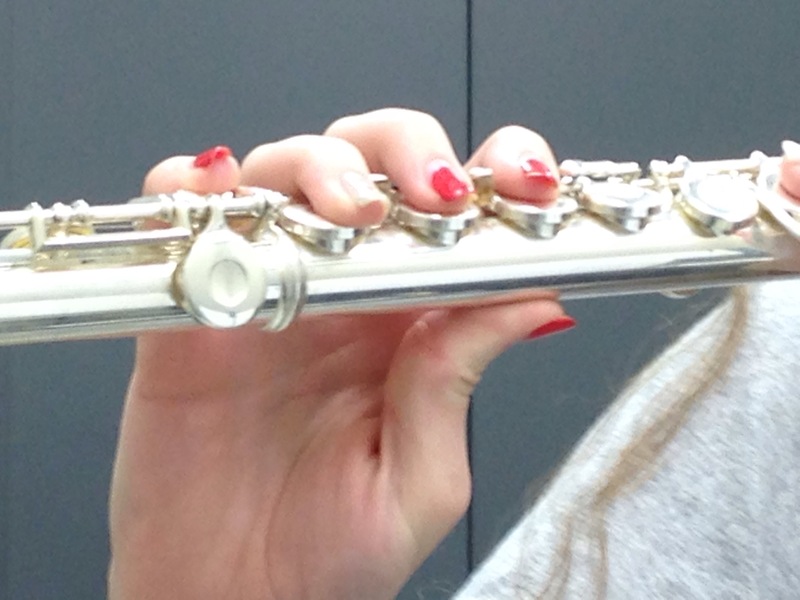 That way, the flute can rest on the right thumb, with the little finger on the Eb key as a counter-balance. My right hand is behind the flute and I am able to move my fingers freely from the joints at the base of my fingers. It is also important that my wrist is relaxed and in a neutral position, not canted to one side or the other. If she continues like this, this student will have a lot of trouble developing her technique. Also, her tone is small, covered and flat. The first thing I would do is realign her headjoint so the blow hole is between the keys and the rods. Then she will need to learn to rotate the flute body away from her so she can let the flute rest on her thumb. She will also need to retrain herself so she extends her fingers and learn to move her fingers from the bottom joints rather than the second joints of her fingers. In the case of the second photo, the alignment of the flute is not so much of a problem, though it can probably be adjusted slightly. The problem lies in what she is doing with her right thumb. There are lots of kids with so-called hitchhiker thumbs. This hand position is seriously impacting her ability to develop her technique. She’s also putting a lot of strain on both joints of the thumb. In some cases I have seen that this can lead to repetitive strain injuries. 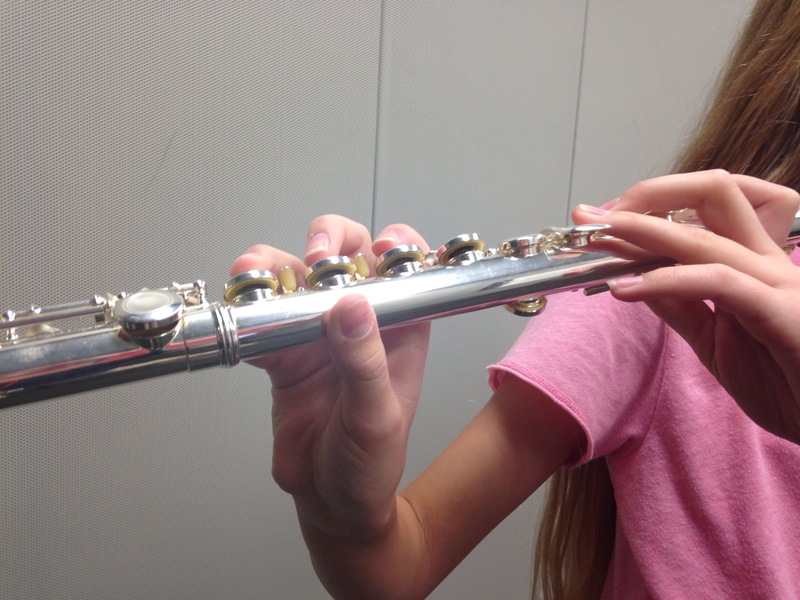 The solution is to teach the student to rotate the thumb so the flute is resting on the side of the thumb, by the fingernail and extending the fingers so it is more like holding a ball or a sandwich. Once she can learn to move her fingers from the base joints, she will quickly acquire facility in her technique. If you find these entries helpful, subscribe, share with your colleagues and come back regularly for more flute tips. Please comment and feel free to ask questions. What do you want to know about flute pedagogy? Maybe the answer to your question will be the next flute tip. Find me on Facebook or email me your questions at dr_cate@sbcglobal.net. For information about clinics and workshops click here. Diagnosing the tone problems we hear with our flute students is one of the thorniest issues we face as teachers. And hand in hand with tone problems are intonation problems. If the sound is not good, chances are that the intonation won’t be good either. The fundamental question is to ask is what is the student doing with their playing apparatus (lips, oral cavity, throat, breathing) that is making it sound the way it does. I have explored this question by trying to create the sound the student is making for myself. Doing this have given me a lot of insight into why a student is having the problems they are having because I’m essentially recreating what they are doing. I learned this trick from my teacher, Thomas Nyfenger, who could imitate anyone, good or bad. Let’s examine the each of the areas of the playing apparatus listed above. Lips – essentially our lips function as our mouthpiece, shaping and directing the air at the blowing edge, assisting in creating sufficient resistance to make a characteristic flute sound. Lips cannot provide support to the air column. Many students squeeze their lips rather than use their supporting muscles. If the sound is reedy, thin, sharp or strident, chances are that the student is pulling their corners, stretching the lips laterally and/or flattening the blowing aperture. It is often a combination of all of these. If the sound is wooly, flat and unfocused, it means the aperture is too large and the student isn’t gripping the airstream firmly enough. If the sound is sweet, clear and small, the student has the flute too high on their bottom lip. This can be caused by being taught the kiss-and-roll when they started. Oral cavity – while it is necessary for the flute to rest (not press) against the bottom teeth with the lip in between, it is important to relax the jaw and open the oral cavity as much as possible. It functions as a resonating chamber, along with the sinuses, nose, throat and chest (ask the singers). If you’ve explored all the possible lip issues and the tone is still small and tight, experiment with opening the oral cavity more. Throat – needs to be open, with the base of the tongue relaxed for the most resonant sound. Squeezing the throat or tensing the base of the tongue will muffle the sound. Students will frequently squeeze here rather than engage their supporting muscles. I like the analogy of imagining that I am on the verge of a yawn. The tongue is down and relaxed and the throat is wide open. Throat is merely a conduit for the air column. Keep all the physical structures of the throat out of the way. Breathing – If everything else is out of the way, then the torso with its abdominal and intercostal muscles are free to support and pressurize the air column. I really like the idea of allowing ourselves to breath naturally, deeply and freely rather than over-analyzing the breathing mechanism. The truth is, kids rarely understand the difference between the quantity of air and the speed of the air. If the air is moving sufficiently fast enough, the sound will be good and it will be in tune, provided that they are playing on a flute with a good scale (note that some of the older brands still have not updated their scale, especially in the beginner level instruments). Sitting up or standing tall with good open posture is critical to being able to use the air effectively. If you find these entries helpful, subscribe, share with your colleagues and come back next week for another flute tip. Please comment and feel free to ask questions. Maybe the answer to your question will be the next flute tip. Find me on Facebook or email me at dr_cate@sbcglobal.net. For information about clinics and workshops click here. Do your flute students look like this, struggling to hold their flutes up, scrunched into tight quarters, leaning their right arms over the back of their chairs, hunched over as if they can barely hold the flute up? I am sure you have seen variations of this with your own students. And you have to constantly remind them to hold their flutes up, sit straight in their chairs, and on and on……. As you can see, the chairs are quite close, everyone can hold their flute up, the kids can sit straight in their chairs with their feet on the floor and the end of each flute is behind the head of the next kid. 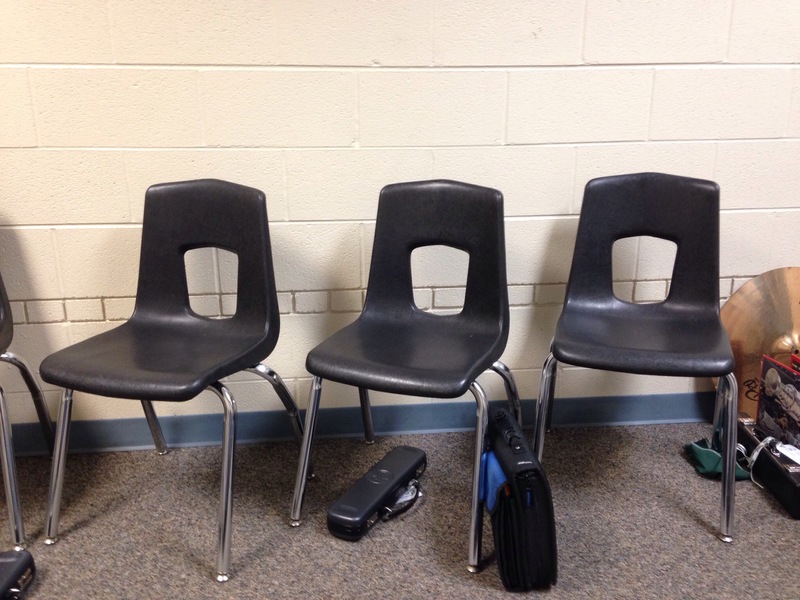 There is plenty of room for everyone, even if you have a small rehearsal space. If you find these entries helpful, please subscribe, share with your colleagues and come back next week for another flute tip. Comments are always welcome. Send your questions and suggestions for future posts to me at dr_cate@sbcglobal.net.